Home→Tour Info→Michael Fournier’s West Coast Tour! 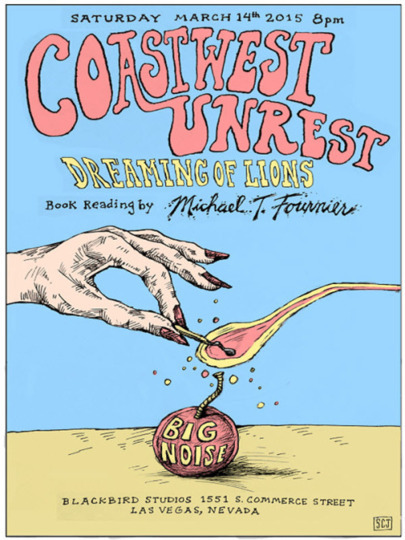 Michael Fournier’s West Coast Tour! Here’s a great opportunity for all you West Coasters to meet Michael Fournier, author of Three Rooms’ Swing State and Hidden Wheel. This March, Michael will be touring the West Coast! In Las Vegas, my friends in Coastwest Unrest set up a show in Gina Quaranto’s Blackbird Studios. This is the sixth time I’ve shared a stage with them, dating back to their first trip to Maine in 2010. 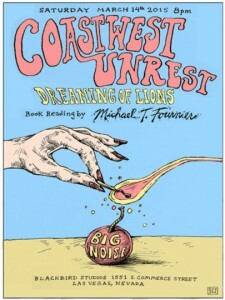 Dreaming of Lions, also on the bill, are no slouches themselves. San Pedro, CA is the home of the Minutemen—I’ve visited before, but have never read there before now. Laurie Steelink’s band Mourners will be playing her Cornelius Projects gallery, and Kristine McKenna, who has a forthcoming book of photos on the White Panther Party, will be there, too. Get psyched! After this is a panel honoring Husker Du drummer Grant Hart at AWP in Minneapolis; I’ll be alongside a ton of great writers, like Constance Squires, Tim Horvath, and Justin Taylor. Then it’s a full East Coast tour in May/June, then THEN a Midwest jaunt with Mike Faloon in July. with John Beer, James Brubaker, Paula Cisewski, Maria Damon, Matthew Derby, Tim Horvath, Daniel Mahoney, Hoa Nguyen, Constance Squires, Justin Taylor, Joel Turnipseed, and maybe a surprise guest or two.